The 40th street bridge is maintained by the City of Pittsburgh, the Borough of Millvale, and Penndot. Alas, the three have a hard time sharing! Sidewalk maintenance is left to those of us who use the bridge regularly. It's legal for cyclists to cross the bridge in the lanes with traffic, but it can be a rather scary and dangerous crossing. More often, we use the sidewalks; as do countless pedestrians and dogs. I'm hoping to raise money to fund my regular sidewalk maintenance! My plan is to visit the bridge with the necessary tools to clean up trash and debris (and unclog drainage holes) at least once a week. I've been doing this sporadically for the last year, but I'd like to make it a more regular part of my week. 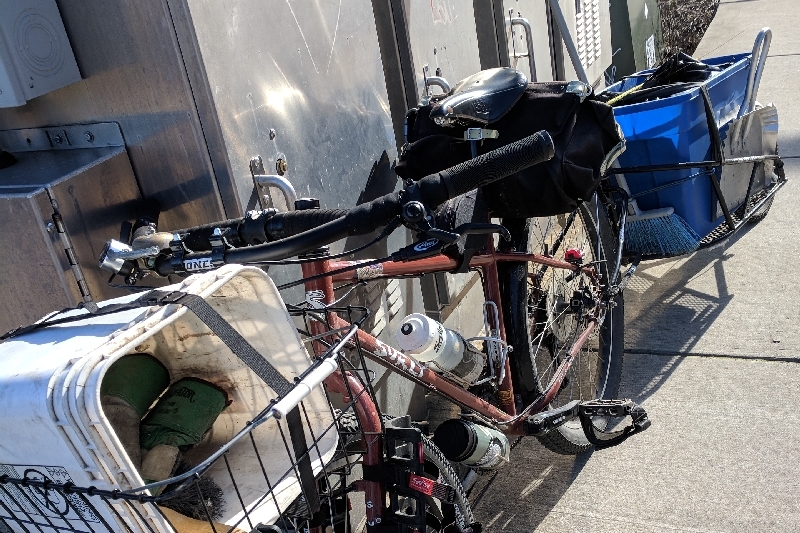 I also occasionally take my bike trailer of tools to clean up the north shore trail as well! The money I raise will help pay for garbage bags, rock salt, a new broom and snow shovel, work gloves, and help pay for the time I spend out there. I'd like to keep this simple and do the work unaffiliated with an existing volunteer organization, and I'm hoping some folks who also use the bridge will find it worthwhile to fund my efforts! swept both sides of the bridge. wasn't able to complete this task today, since it got too dark to work. put in five and a half hours of push-broom sweeping, shoveling piles, and hauling to a dumpster. I'm estimating I hauled 250 pounds of debris today, with more left to go. I'm astonished by just how much debris has been deposited by road plows. Swept one sidewalk of the bridge with a push-broom from end to end. Both sidewalks are covered in glass, trash, and large chunks of pavement (from plowing). A thorough sweeping took three hours to finish one walk. I'll get the other side after work today, hopefully. removed large debris from the East sidewalk. probably stuff that fell from a truck onto the roadway. planning a more thorough cleanup when the weather improves next week!